Around 11 am, the rupee plunged to 70.08 to a US dollar. However, soon afterward the Reserve Bank of India (RBI) is said to have intervened in the open market to curb the rupee’s free fall. A strong US economy and fears over a rise in global protectionist measures pushed the Indian rupee to a fresh intra-day low of over 70 against the US dollar during the pre-afternoon hours on Tuesday. On Monday, the partially convertible rupee had slumped to a fresh new low of 69.62 against one US dollar tracking panic in emerging markets and on Asia Pacific currency exchanges where all domestic units fell in tandem fearing the “spread of contagion” triggered by nearly 45 per cent crash in Turkey’s lira against USD in just two days. Europe is in more turmoil, say analysts following President Donald Trump’s decision to impose 20 per cent and 50 per cent duty on the imports of aluminium and steel from its NATO ally, Turkey. In early deal of interbank foreign exchange the rupee recovered little ground on Reserve Bank of India’s intervention which dealers and bankers claim as just “tokenism” to mitigate volatility. Panic was further fuelled by the US decision to impose sanctions on Iran aimed at blocking its crude oil exports to its traditional customers such as India. US and China are already at loggerheads and the cumulative impact of the series of measures by Trump pose a bigger threat to global trade, say analysts. Mumbai-based IFA Global, a foreign exchange advisory and treasury outsourcer, in a note said “the psychological 70/$ mark is now in sight” as RBI looks less keen to intervene except to tackle volatility. However, the central bank on Monday did step in to retrieve the falling rupee from 69.62/$ (down 78 paise or 0.98 per cent) to 69.48/$. On Monday, Mumbai-based IFA Global, a foreign exchange advisory and treasury outsourcer, in a note said “the psychological 70/$ mark is now in sight” as RBI looks less keen to intervene except to tackle volatility. However, the central bank did step in to retrieve the falling rupee from 69.62/$ (down 78 paise or 0.98 per cent) to 69.48/$. JP Morgan , apparently disagreeing, felt the decline of the Turkish lira and reasons behind it are very specific to Turkey and do not have potential to derail positive fundamentals of other EMs. Analysts in Dalal Street also feel the impact of tariff war between the US and Turkey would impact mostly European markets as they maintain the main threat to India’s currency comes from volatility in crude oil prices as has been warned by RBI in its latest credit policy. a lasting effect in domestic currency and equity markets, feel the analysts. The say a $10 rise in the price of crude oil per barrel impacts GDP by 050 per cent or 50 basis points. The market analysts also cite the government’s plan to drastically cut import bill by more than $1 billion by using modified petrol fuel for vehicles. 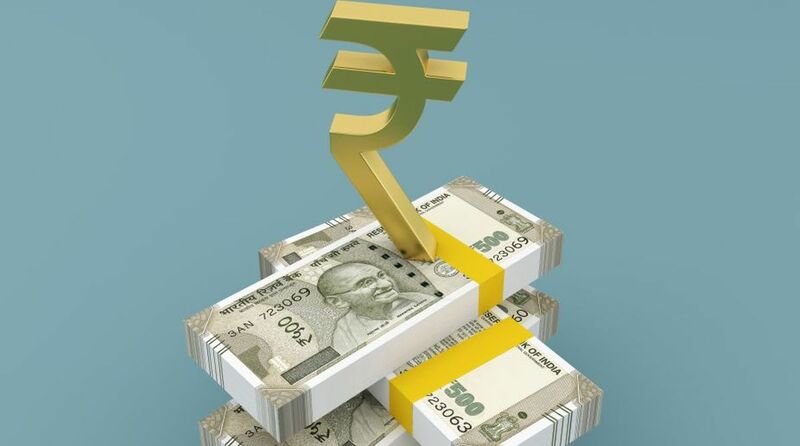 The rupee betrayed signs of weakness early in the morning before the start of the week’s business in Mumbai in the Singapore non-deliverable forward market or NDF where speculators and investors cut over the counter deals. This year the currency has depreciated 7.2 per cent in trade with US dollar. On Monday some commercial banks also sold dollars under RBI’s instructions to shore up the rupee’s value. After panic sell-off in Dalal Street in early trade, the 30-share Sensitive Index of Bombay Stock Exchange and 50-scrip Nifty of national Stock Exchange remained under pressure as speculators booking profit showed no sign of let up in pressure. Only IT shares thrived on the weakness in the rupee as it suits their outsourcing business and dollar revenue earnings. Thus for the second straight session, equity came under pressure on account of profit booking at higher levels. Brokerages still maintain that the back-to-back correction would lead to consolidation of bull market as the continuing rise in bellwethers of BSE and NSE is driven by improving macros such as economic growth and solid Q1 earnings season. The trade in Dalal Street was in line with other regional exchanges in Far East where Nikkei of Japan, Hang Seng of Hong Kong, Straits Times of Singapore and Shanghai Composite of China bled and ended in the red for the second consecutive session. The Morgan Stanley Composite Index or MSCI (outside Japan) was at a nearly one year low as it fell 1.5 per cent intra-day. Nikkei closed 1.98 per cent down at 21,857.43 (-440.65) points; Hang Seng 27,936.57 (-430.05) points -1.52 per cent; Straits Times 2,786.25 (-34.25) points, -1.04 per cent; and Shanghai was 0.32 per cent down at 2,786.25(-9.06) points. Gains in IT segment pushed NSE’s IT Index to intra-day high of 14,879.20 points up 1.5 per cent mainly driven by Infosys Technology which touched Rs 1,409.80/share on two exchanges. The stock has outperformed the benchmark Nifty by gaining 7 per cent in the last four weeks. Other IT shares were also up. Although the indices pared losses, weakness remained on account of profit booking in banks, auto, energy and metal stocks. However, GAIL was an exception as it jumped 4 per cent to Rs 378.60 high intra-day. CLSA rated the stock “buy” with target of Rs 435/stock saying its Q1 numbers were beaton-all-fronts. Sensex closed 37,644.90 (-224.33) points down 0.59 per cent on Monday. Nifty at 11,355.75 (-73.75)points declined 0.65 per cent. In Sensex 11 shares advanced and 20 were down. For Nifty the ratio was 19:31. Nifty Bank lost ground for a second session in a row as it settled at 27,794.40 (-329.85) points down 1.17 per cent. Gainers in BSE benchmark included Infy Rs 1,410, 1.79 per cent; Wipro Rs 283.50, 1.50 per cent; MM Rs 955.40, 1.10 per cent; and Coal India Rs 278.45, 0.89 per cent. Yes Bank was 3.66 per cent down at Rs 371.10 and SBI Rs 294.80, -3.17 per cent.